We will offer the following parcel of land at auction “On Site” at the land located from– Located from the Grand Falls Casino on Hwy. #9 NW of Larchwood, IA – 1 mile west on 100th St. to Ashley Ave., then approx. 3/4ths mile south on Ashley Ave. – with the NW Corner of the land at the Jct. of Ashley Ave. & 110th St.; or from Sioux Falls, SD (Jct. Hwy. #11 & #42 – Dawley Village Shopping Center) – 5 ½ miles east on Hwy. #42 to the east edge of Rowena, SD, then approx. 1.25 miles south on 483rd Ave., then approx. 1.25 miles east on SD 268th St./IA 100th St., the 6/10ths miles south on Ashley Ave. to the NW Corner of the land. 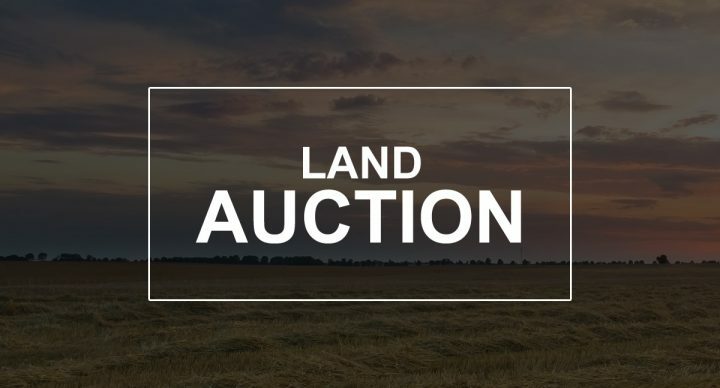 Auctioneer’s Note: This auction presents an opportunity to purchase a productive parcel of Lyon, County Iowa land with a high percentage tillable that would serve as an excellent addition to an area farming operation or as an investment. Enhancements improving the productivity of this land have been made, including drain tile throughout areas of the farm and tree removal. This land is not leased and is available for a new owner to operate or lease to a tenant of their choice for the 2019 crop year, with immediate possession conveyed to the purchaser subsequent to execution of the purchase contract. If you are in the market for a parcel of land situated in prominent agricultural area in Sioux Township in Lyon County, Iowa, then get your financing in order and make plans to be in attendance at this land auction. +/-139.64 Surveyed Acres of Sioux Twp., Lyon Co., Iowa Land – This farm has a very high percentage of cropland, productive soils and a gently rolling to rolling topography. According to FSA information this farm has approx. 130.06 acres of cropland, which appears to be slightly understated – due to some tree removal and dirt work completed by the owner, as presently the owner estimated there is approx. 135 acres under cultivation; with an FSA 66.4 acre corn base with a 158 bu. PLC yield and a 53.9 acre soybean base with a 40 bu. PLC yield. According to the Lyon County Assessor this parcel has an overall CSR soil rating of 51.02, comparatively information obtained from Surety Agri-Data indicates that this parcel has a CSR2 index of 51.6. The nontillable acres on this farm are comprised of waterways & road. According to a previous owner this farm has been enhanced by the installation of approximately 3,435’ of drain tile in various areas of the farm which was installed by AB Excavation in 2010. This property has Lyon-Sioux Rural Water in place on the property with a hydrant located in the Northwest Corner of the farm. According to the Lyon Co. Treasurer the current RE taxes (payable 2018-2019) are $2,324.00. This farm is available for a new owner to farm or lease, with full possession to be awarded for the 2019 crop year. LEGAL DESC. : Essentially being the Fractional NW ¼ – legally described as Parcel C in the W ½ of Sec. 16, T.100N., R. 48W., Sioux Twp., Lyon Co., Ia. TERMS: Cash – A 10% non-refundable downpayment sale day & balance on or before May 24, 2019 w/full possession for the 2019 crop year. Marketable Title will be conveyed and an abstract of title will be continued and provided to the buyer for examination. Closing Agent for this property will be the Bonander Law Office in Larchwood, IA – with the closing fees paid by the seller. The seller will pay 100% of the RE taxes payable in 2019, with the buyer to pay 100% of the RE taxes payable in 2020. The acres in this farm is based on the acres as stated on the county tax records, with the acres understood to be “more or less”. The sellers do not guarantee that existing fences lie on the true and correct boundary and any new fencing, if any, will be the responsibility of the purchaser(s) pursuant to Iowa Law. FSA cropland acres, yields, bases, payments & other information are estimated and not guaranteed and are subject to implementation of the New Farm Bill & County Committee Approval. Information contained herein is deemed to be correct but is not guaranteed. This property is sold in “AS IS CONDITION” and subject to any existing easements, restrictions, reservations or highways of record if any, as well as any or all Lyon Co., IA Zoning Ordinances. The RE licensees in this transaction are acting as agents for the sellers. Sold subject to confirmation of the Owner. For addt’l information, contact the auctioneers. Ashley Ave. & 110th St.